I met an amazing lady via Twitter Lauren Mai and we have decided to complete a collaborative Blog to spice things up a bit. She has been an unbelievable inspiration to me in such a short time and I want to make sure others get to experience her work! Make sure to head over to Lauren’s Website and see her take on “Your Only Limit Is Yourself” HERE. Have you ever felt like you are not where you thought you would be and should have a completely different life? Have you ever wished you had done more with your life? Look at others and wish you could have what they have? What about feeling like you have way too much going on and never having the time to just…..RELAX and focus on what you want in life. Well, most of this thinking is a result of what is known as the “Ceiling Effect”. What is the “Ceiling Effect” – Regardless if you have set a goal and achieved them or haven’t set a goal at all, you believe you are likely to not achieve better, so you limit yourself. You cap your own belief and potential – usually based on fear of failure or the work required to keep going. Not only can having a “Ceiling Effect” limit your ability to achieve more in life, it’s a version of self sabotage. How? Because you stay exactly where you are and are very unlikely to ever achieve more. For this Blog I wanted to talk about how the “Ceiling Effect” can also relate specifically with technology. When it comes to technology in today’s age, a lot of us have become reliant on our devices. Not only to do our jobs or complete daily tasks, but to fill a void of time. This could be while you are waiting in line at the grocery store, waiting in traffic (most places now have a hefty penalty for this), before you go to bed or first thing when you wake up to check social media, and like a lot of us, using it while in the bathroom. (I’m 100% guilty of this one). So how can this “Ceiling Effect” apply to limiting technology? We could feel our lives are fine the way they are and we do not need to change. We could feel it would be too difficult to incorporate a new system into our daily schedules so we just don’t try, or we could set limits that are minimal to start out with but never increase them to a point that really changes the family dynamic for the better. 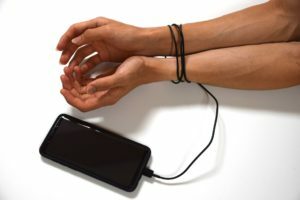 How much better could you improve your life if you felt fulfilled and joyful and were “less connected” to our devices? How Can We Heighten Or Eliminate The “Ceiling Effect”? Never Stop Learning – Always feel there is more out there. Build a desire to continually learn. Read books, find people who have the same mindset, and are positive influences. Always keep an open mind to new possibilities and new information. Set Goals & Keep Expanding Your List – Limiting technology can be hard. Especially if you rely on it. Start out small and once you have achieved that goal, keep going! Ask yourself, what are other ways I could limit Tech? What areas do I feel I am struggling with most? Is there a person I could learn from or a book I can read to achieve this? Some goal examples can include; limiting tech use from 6pm to 8pm daily, no tech day where you don’t use devices after you come home for the evening, or not checking your phone first thing in the morning. Know We May Make Mistakes – There are some things in life we may fail at, but don’t feel that is an end all situation. You can learn from the mistake, make adjustments and continue on the course. Plus, mistakes allow you to become a stronger person. Example: If you had set a goal to not use your phone while out watching your kids soccer game and while you were there you got really bored and still checked it anyways, don’t look back later thinking you can’t do this all because you made the action to check your phone. Just re-evaluate and make changes for next time and try to do better. It’s an adjustment period. Small changes each day will result in a bigger completed picture over a period of time. This could be days, weeks, months, or years down the road. What Change Can I Expect To See From Removing The “Ceiling Effect”? When applied to limiting technology, your relationships will become closer. You can have more direct interactions with those close to you. Especially those who are in your own home. Have you ever messaged someone in your house that was sitting across the room from you to ask them something, or just to be funny and have conversation? I have. So much is lost when we use texting, messenger, Twitter, e-mails like tone. I’ve seen arguments started over a miscommunication as the other side took the tone wrong and that was the end of that conversation. You allow your mind to freely think and you can become more creative with problem-solving. Ever have a problem in your life and you just have no idea how to fix it? Relationship issue, financial, heck, even what you will do for the weekend? Ever realize some of your best ideas come to you while you are in the shower or just about to fall asleep? It’s because we are not occupying every moment of our brains and we can start to think outside the box to solve our problems. You will increase your goals and dreams to a much higher standard. You will become hungry to achieve those goals and find ways to make them happen. Even if you were only able to achieve one of these listed above, is it not worth a try? What’s the worst that can happen? Your achievements could be limitless! Again, don’t forget to head over to Lauren Mai’s Blog at to view “Your Only Limit Is Yourself” HERE. If you would like us to collaborate with another blog in the future, send myself or Lauren an email/comment and let us know! We would love to hear what you think about our collaborative Blog! Feel free to visit Lauren’s full website HERE.